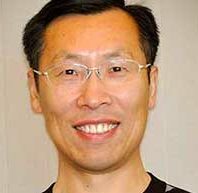 Dr. David Liu’s laboratory studies the molecular and cellular mechanisms that control cell proliferation, survival, genomic stability, and the organization of subcellular structures. Our research has provided major insights into the mechanism that underlies the pathology of several human developmental diseases including cancer, Alzheimer’s disease, stroke, ciliopathy, and dwarfism. Our work is relevant to prevention and treatment of these diseases. Our studies have revealed that expression of ATF5, a bZIP protein of the ATF/CREB family of transcription factors, is significantly elevated in transformed cells and that ATF5 is required for the proliferation and survival of cancer cells (including breast, colon, brain, pancreatic, and lung cancers among others), but not for non-cancer cells. Our research revealed mechanisms that control ATF5 expression and identified targets that mediate ATF5 function (Li et al., Mol. Cancer Res. 2009; Dluzen et al., J. Biol. Chem. 2011; Li et al., J. Biol. Chem. 2011; Liu et al., Mol. Cell. Biol. 2011; Hu et al., Anticancer Res. 2012; Liu et al., J. Biol. Chem. 2012). The discovery of centrosome over 100 years ago had been regarded as important as the discovery of the nucleus but it was only recently that research on centrosomes has moved this central organelle to the forefront of modern research. Centrosome as the primary microtubule organizing center (MTOC) in mammalian cells is critically important for cell cycle regulation and maintenance of genomic stability while centrosome dysfunctions have been implicated in numerous diseases including cancer, infertility, ciliopathy, and microcephaly, among others. We showed that ATF5 acts unexpectedly as a structural protein in the centrosome, and that ATF5 forms a 9-fold symmetrical ring structure that tightly surrounds the proximal end of the mother centriole. The formation of PGT-ATF5-PCNT tripartite in the centrosome secures centriole-PCM interaction (Madarampalli et al., Cell 2015; Lengel et al., Cell Cycle 2015). Previous research indicates that inappropriate activation of the cell cycle machinery mediates neuron apoptotic death during both normal developmental and pathological conditions. We are particularly interested in understanding the involvement of the CDK-Rb-E2F axis, a central cell cycle pathway, in regulation of neuronal cell death (Liu et al., Genes&Dev., 2005; Biswas et al., J. Neurosci., 2005; Liu et al., J. Neurosci., 2004; Liu and Greene, Neuron, 2001). Our laboratory is making exciting discoveries in a number of frontiers, where both post-doctoral fellows and pre-doctoral students who seek biological research as a component of their career may find excellent training opportunities. As a part of that, one can learn a variety of experimental techniques and use them to address fundamental biological questions. Contact David Liu at d.liu@wsu.edu for research opportunities. Wang M, Hu M, Li Z, Qian D, Wang B, Liu DX. miR-141-3p functions as a tumor suppressor modulating activating transcription factor 5 in glioma. Biochem Biophys Res Commun. 2017 Jun 6. pii: S0006-291X(17)31095-1. doi: 10.1016/j.bbrc.2017.05.179. [Epub ahead of print] PubMed PMID: 28595907. Ming Hu, Bin Wang, Dongmeng Qian, Mengyuan Wang, Rui Huang, Li Wei, Ling Li, Li Zhang, David X. Liu. Human cytomegalovirus immediate-early protein promotes survival of glioma cells through interacting and acetylating ATF5. Oncotarget. 2017; 8:32157-32170. F1000 Recommended: Andrew Fry, Faculty of 1000 Cell Biology, 12 Aug 2015. Jiang Y, Wang Y, Wang T, Hawke DH, Zheng Y, Li X, Zhou Q, Majumder S, Bi E, Liu DX, Huang S, and Lu Z (2014). PKM2 phosphorylates MLC2 and regulates cytokinesis of tumour cells. Nature Communications 5, 5566. doi:10.1038/ ncomms6566. Hu M, Wang B*, Qian D, Li L, Zhang L, Song X, and Liu DX* (2012). Interference with ATF5 function enhances the sensitivity of human pancreatic cancer cells to paclitaxel-induced apoptosis. Anticancer Res. 32(10):4385-94. Lengel KL and Liu DX* (2012). Cell type-dependent function of ATF5: Where we go from here. Cell and Development Biol. 1:e114. doi:10.4172/2168-9296.1000e114. Zhang Y, Cheng Y, Ren X, Horis T, Huber-Keener KJ, Zhang L, Yap KL, Liu DX, Shantz L, Qin Z, Zhang S, Wang J, Wang HG, Shih IM, and Yang JM (2012). Dysfunction of Nucleus Accumbens-1 Activates Cellular Senescence and Inhibits Tumor Cell Proliferation and Oncogenesis. Cancer Res. 72(16):4262-75. PMID: 22665267. Chen A, Qian D, Wang B, Hu M, Lu J, Qi Y, and Liu DX (2012). ATF5 is overexpressed in epithelial ovarian carcinomas and interference with its function increases apoptosis through the downregulation of Bcl-2 in SKOV-3 cells. Intl. J. Gynecological Path. 31(6):532-7. PMID: 23018213. Liu X, Liu D, Qian D, Dai J, Jiang S, Stanley B, An Y, Yang J, Wang B, Liu X, and Liu DX* (2012). Nucleophosmin (NPM1/B23) interacts with ATF5 and promotes proteasome- and caspase-dependent ATF5 degradation in hepatocellular carcinoma cells. J. Biol. Chem. 287(23):19599-609. PMID: 22528486. Liu DX*, Qian D, Wang B, Yang JM, and Lu Z (2011). p300-dependent ATF5 acetylation is essential for Egr-1 gene activation and cell proliferation and survival. Mol. Cell. Biol., 31(18):3906-3916. PMID: 21791614. Dluzen D, Li G, Tacelosky D, Moreau M, and Liu DX* (2011). Bcl-2 is a downstream target of ATF5 that mediates the pro-survival function in a cell type-dependent manner. J. Biol. Chem. 286(9):7705-13. PMID: 21212266. Zhang Y, Cheng Y, Ren X, Zhang L, Yap KL, Wu H, Patel R, Liu DX, Qin ZH, Shih IM, and Yang JM (2011). NAC1 modulates sensitivity of ovarian cancer cells to cisplatin via altering the HMGB1-mediated autophagic response. Oncogene 31(8):1055-64. PMID: 21743489. Li G, Xu Y, Guan D, Liu Z, and Liu DX* (2011). HSP70 promotes survival of C6 and U87 glioma cells by inhibition of ATF5 degradation. J. Biol. Chem. 286(23):20251-9. PMID: 21521685. Haakensen J, Kester M and Liu DX* (2011). The ATF/CREB family of transcription factors in breast cancer. In: Targeting New Pathways and Cell Death in Breast Cancer. Ed. Rebecca L. Aft. InTech, ISBN 978-953-51-0145-1, pp. 71-83. Zheng Y, Yang W, Xia Y, Hawke D, Liu DX, and Lu, Z (2011). Ras-induced and ERK1/2 phosphorylation-dependent isomerization of PTP-PEST by PIN1 promotes FAK dephosphorylation by PTP-PEST. Mol. Cell. Biol., 31(21):4258-4269. PMID: 21876001. Liu X, Yang JM, Zhang SS, Liu XY, and Liu DX* (2010). Induction of cell cycle arrest at G1 and S phases and cAMP-dependent differentiation in C6 glioma by low concentration of cycloheximide. BMC Cancer 10:684-694. Samarrai W, Liu DX, White AM, Studamire B, Edelstein J, Srivastava A, Widom RL, and Rudner R (2010). Differential response of Bacillus subtilis ribosomal 1 RNA promoters to nutritional stress. J. Bact. 193(3): 723-33. Hu M, Qian D, Hou Y, Peng K, Li L, Song X, Liu DX, and Wang B (2010). Expression of ATF5 and Bax in the apoptosis of pancreatic cancer cells SW1990 induced by paclitaxel. J. Med. Postgrad. (China), 23(11):1127-31. Wu H, Zhu H, Liu DX, Niu TG, Ren X, Patel R, Hait, WN, and Yang JM (2009). Silencing of elongation factor-2 kinase potentiates the effect of 2-deoxy-D-glucose against human glioma cells through blunting of autophagy. Cancer Research 69(6):2453-60. Li G, Li W, Angelastro JM, Greene LA, and Liu DX* (2009). Identification of a novel DNA binding site and a transcription target for ATF5 in C6 glioma and MCF-7 breast cancer cells. Molecular Cancer Research 7(6):933-43. Greene LA, Liu DX, Troy CM, and Biswas SC (2007). Cell Cycle Molecules Define A Pathway Required For Neuron Death In Development And Disease. Biochimica et Biophysica Acta 1772:392-401. Ding Y and Liu DX* (2007). Cycling to Death: Involvement of Cell Cycle Molecules in Neuronal Apoptosis. In: Cell Apoptosis Research Advances. Ed. Carter. R. Kattleworth. Nova Scientific, New York, NY. pp 23-41. Biswas SC, Liu DX, and Greene LA (2005). Bim is a direct target of a neuronal E2F-dependent apoptotic Pathway. J. Neurosci., 25(37):8349-58. Liu DX*, Nath N, Chellappan SP, and Greene LA (2005). Regulation of neuronal survival and death by p130 and associated chromatin modifiers. Genes&Dev. 19(6):719-32. Greene LA, Biswas SC, and Liu DX (2004). Cell cycle molecules and vertebrate neuron death: E2F at the hub. Cell Death Differ. 11(1):49-60. Liu DX*, Biswas SC, and Greene LA (2004). B-myb and C-myb play required roles in neuronal apoptosis evoked by NGF deprivation and DNA damage. J. Neurosci. 24(40):8720-5. Angelastro JM, Moon NY, Liu DX, Yang AS, Greene LA, Franke TF (2001). Characterization of a novel isoform of caspase-9 that inhibits apoptosis. J. Biol. Chem. 276(15):12190-200. Liu DX* and Greene LA (2001). Neuronal apoptosis at the G1/S cell cycle checkpoint. Cell Tissue Res. 305(2):217-28. Liu DX* and Greene LA (2001). Regulation of neuronal survival and death by E2F-dependent gene repression and derepression. Neuron 32(3):425-38. Zhang Y, Wang Z, Liu DX, Pagano M, Ravid K (1998). Ubiquitin-dependent degradation of cyclin B is accelerated in polyploid megakaryocytes. J. Biol. Chem. 273(3):1387-92. Lu Z, Liu DX, Hornia A, Devonish W, Pagano M, Foster DA (1998). Activation of Protein Kinase C Triggers Its Ubiquitination and Degradation. Mol. Cell. Biol. 18(2):839-45. Liu DX (1990). DNA regions in the genome of silkworm Attacus ricini contains sequences that structurally and functionally resembles both eukaryotic and prokaryotic promoters. J. Qingdao Univ. 2(1):88-94. Liu DX and He X (1989). A study on plasmids harbored in thermophilic bacteria – Isolation and characterization of plasmids from Bacillus thermophilus. Chinese J. Biochemistry 5(1):56-60. Liu DX, Shen L and Li Z (1989). Attacus ricini genomic DNA contains regions that can act as prokaryotic promoters. J. Genetics (Allerton Press, New York, NY.) 15(1):59-72. Liu DX, Shen L and Li Z (1988). Cloning and characterization of DNA fragments from the genome of silkworm A. ricini that function as promoters in E. coli. Acta Genetica Sinica 15(2):102-10.